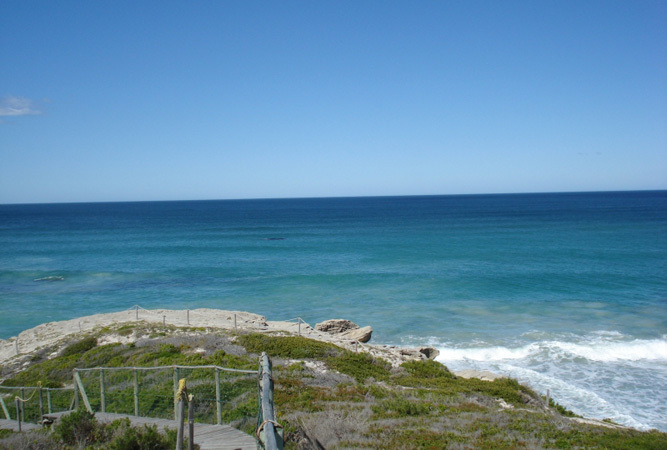 The first step in wishing the ‘world’ goodbye came as I drove through gates of De Hoop marine and nature reserve. Three hours drive from Cape Town; it was a welcome reprieve from the long road, its shops, stores and gas stations. What unfolded before me was all natural. Once we had booked in and had lunch at the restaurant beside the reception area, I walked around the corner to find an ostrich sitting close to a quad bike. The two were side by side beneath a tree whose branches spread out over a large part of sandy grass. The story goes that this ostrich seldom moves from the quad bike and seems to be drawn to its bright red and yellow colours. And that was when I truly escaped into the wilderness. A wooden white and yellow boat putted along to the other side of the tranquil lagoon and moored beside the swaying jetty. Standing before us was a quaint, old barn where people occasionally held weddings and two stone-walled houses that beckoned us in. A family occupied the cottage closest to the water and ours was slightly further back, tucked next to a tree and an old warehouse. I stepped through the porch with my single bag and camera until my feet creaked along the wooden passageway of the house. The high ceilings, wooden floors and sash windows looking out over the dry bushes reminded me of my grandmother’s house. We were a large group all staying in different rooms of this big house and that night would be sit beneath the tree with its hanging lanterns and listen to ghost stories of the old woman who once lived here. I half-listened and gazed out over the tips of the fire’s flames and towards the dark lake and over the land where animals hibernated for the night. In the morning before the sun had a chance to really ignite the temperature we set off on a walking trail through the reserve. Birds waded on the shores of the vlei avoiding the dry floating grass and other skimmed the surface of the water with their feet whilst taking off into the skies. Not far from the water we spotted mountain zebra moving over the flat land. Their ears pricked up into the air alert for any possible danger. There are no wild cats on the reserve to attack them, so in this case we were it. Our walk took us amongst rare fynbos, taller bushes and throughout vast amounts of untouched land. There we saw caramel coloured eland moving in a line parallel to the sand dunes and bontebok nibbling on grass. Their bold dark brown and white markings were in stark contrast to the green land with its dry, grey trees. By the time we were hugging the coastline, the wind had picked up and it started to drizzle lightly. I pulled my jacket closer to my chest and walked along the rock pools where divers resurfaced from a research dive. With the call of birds in the air, the wind howling around me and not much else surrounding us, this is how I remember De Hoop. 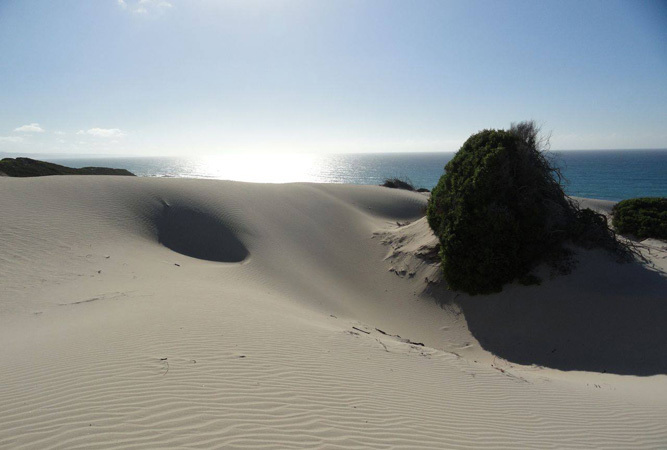 Book your place to stay in De Hoop today and feel the magic of nature surrounding you or find all other hotels in Cape Town here.